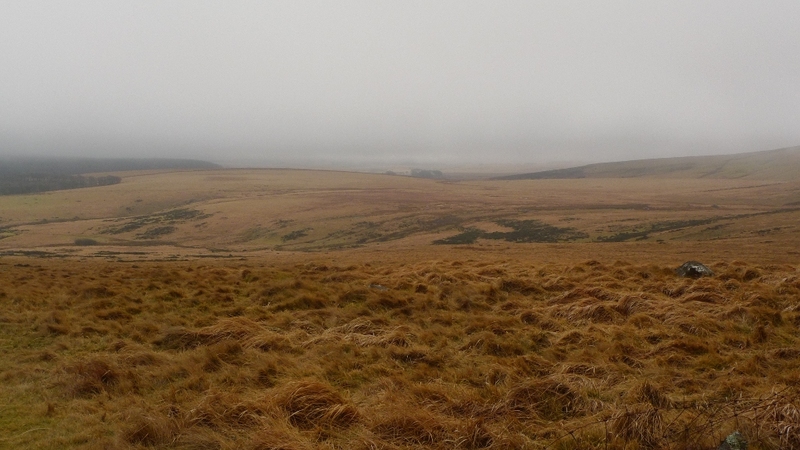 For my last day on Dartmoor I was finally treated by the weather gods, there was a promise of a bit of sun and no mist. 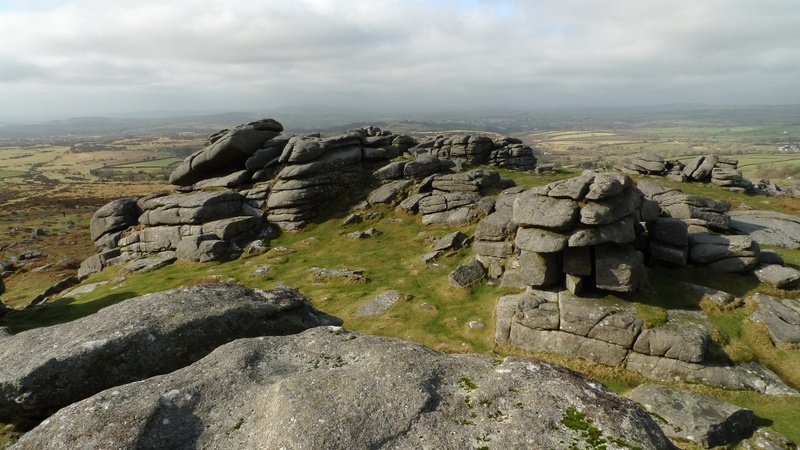 I had fancied a jaunt around Great Mis Tor all week as I had read that it is a great vantage point. 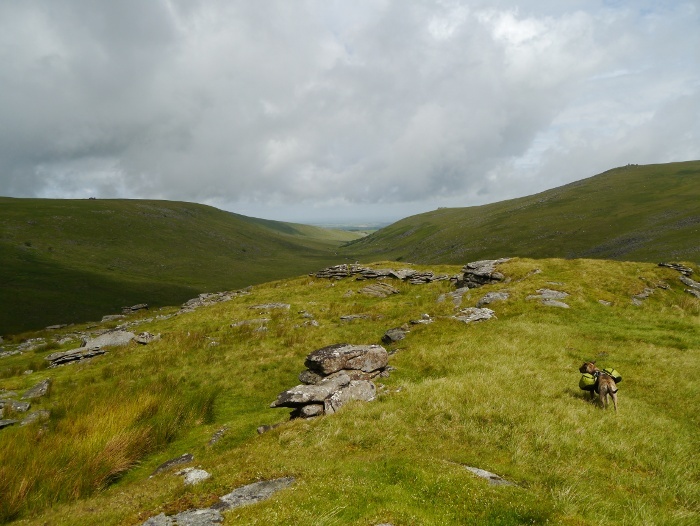 The good weather coincided with a non firing day on the adjacent Merrivale range, an opportunity to explore the interior. 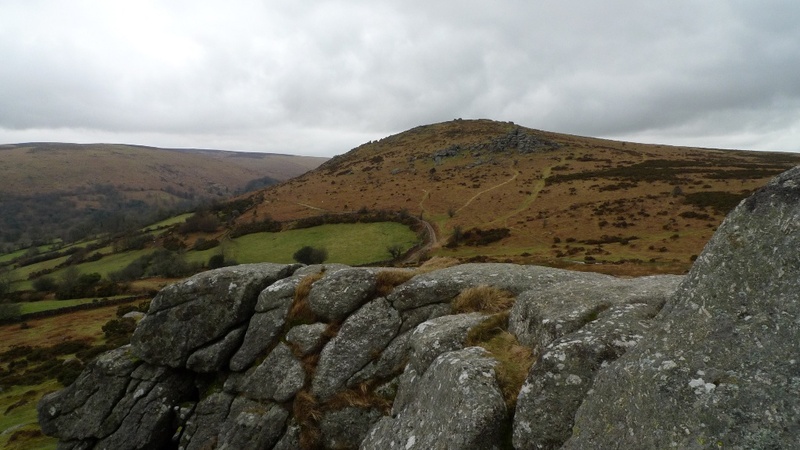 Feeling a little angry and self-righteous I turned my back on the splendid tor and followed the path to the much more welcoming Pew Tor with its view of my destination later in the day. The low extensive rocks were worth scrambling over for a few minutes. 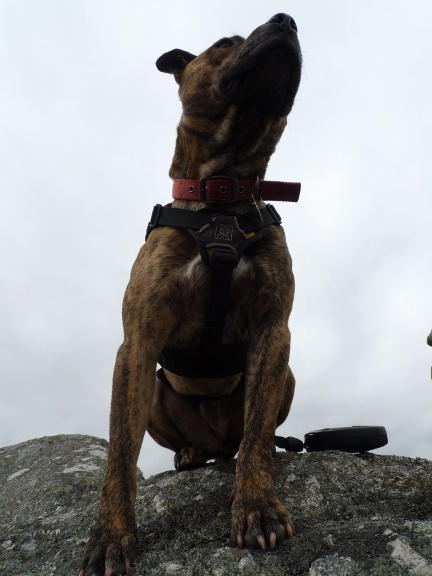 I stood on the highest point and watched a child’s head pop up only to receive a lick on the face from Reuben who had been waiting for him. 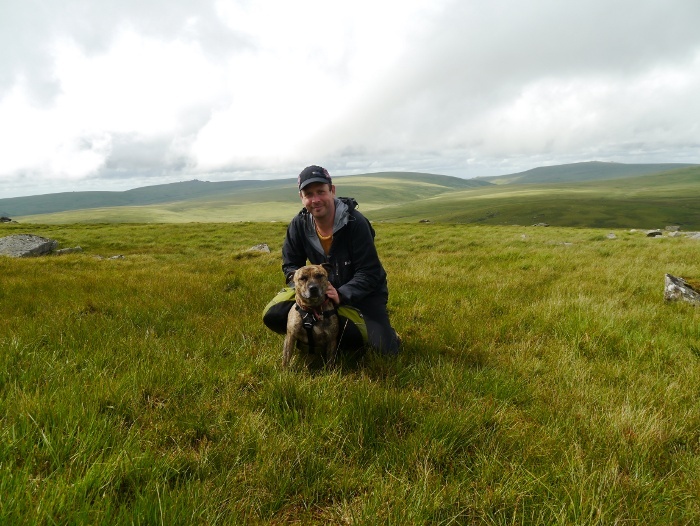 I suppose that the last thing you expect when climbing a Dartmoor tor is to have a large Staffie head bearing down on you! 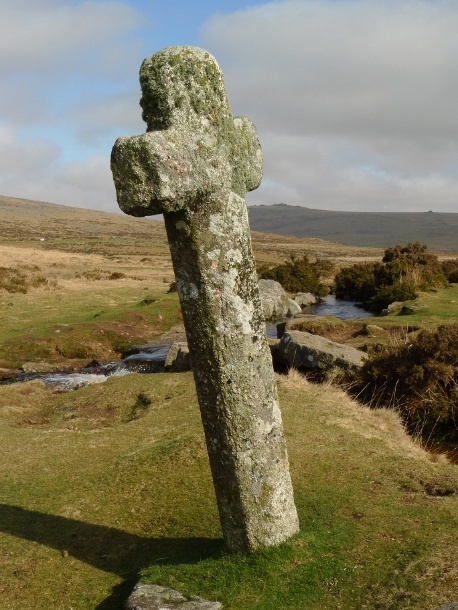 Contouring around Feather Tor we passed a lovely ancient cross situated next to a well constructed leat full of cold clear water. It took a bit of persuading to get Reuben to leap across! 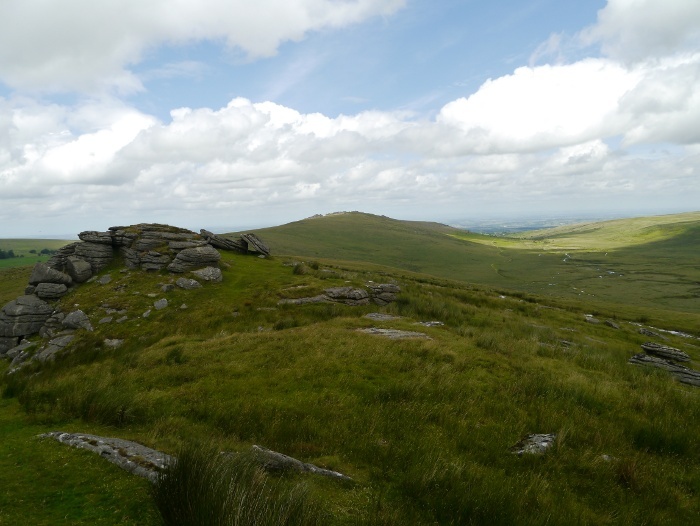 The skyline of Cox Tor was our next destination and we walked through the large car park onto the busy road. 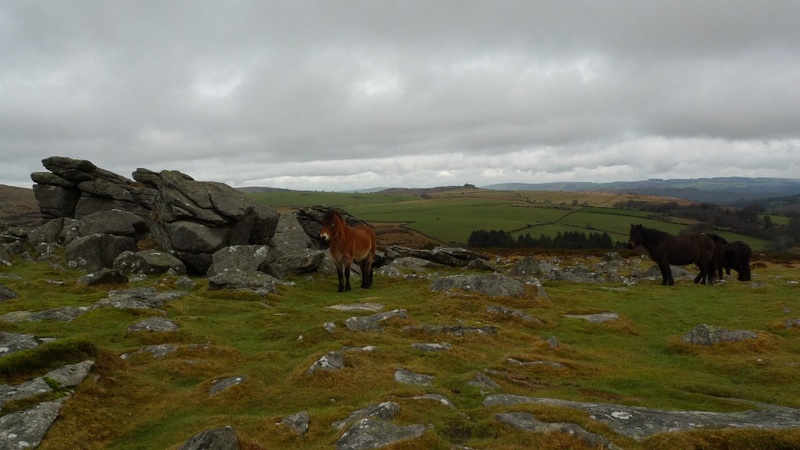 It appears that this is a favourite hang out for the local Dartmoor ponies looking for titbits from the tourists. 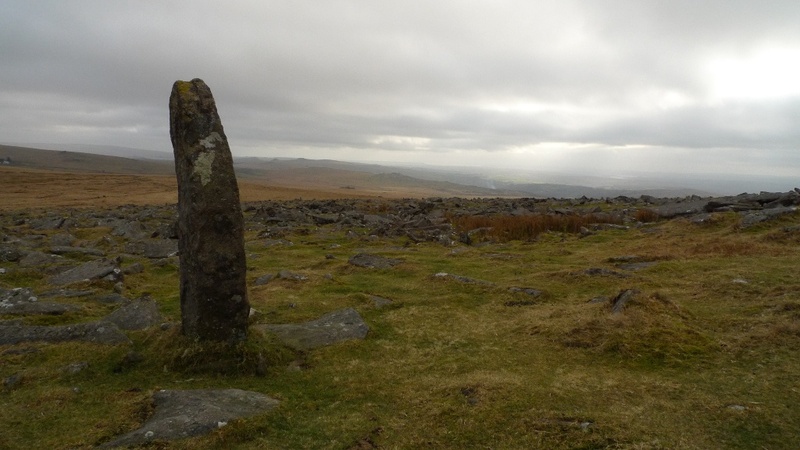 The climb up to Cox Tor itself was along an easy grassy path and we were soon at the trig point. 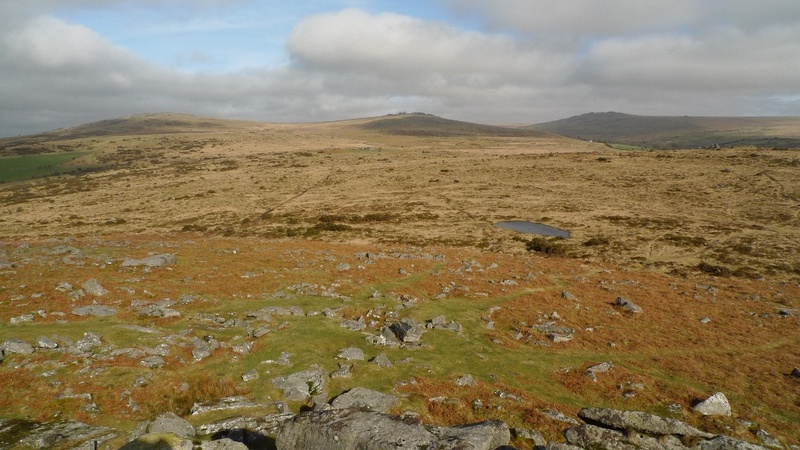 The views from there are classic Dartmoor with tors adorning just about every hill-top. 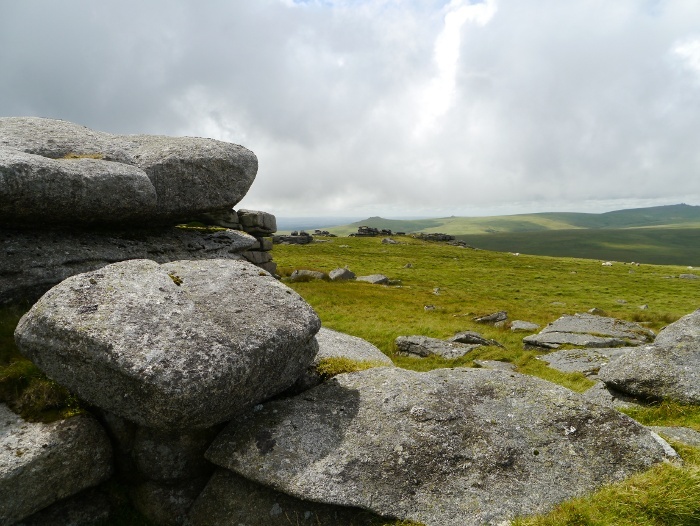 I expected the col below Great Staple Tor to be wet and boggy but the close-cropped grass continued and we were at its stacks of rocks quickly. 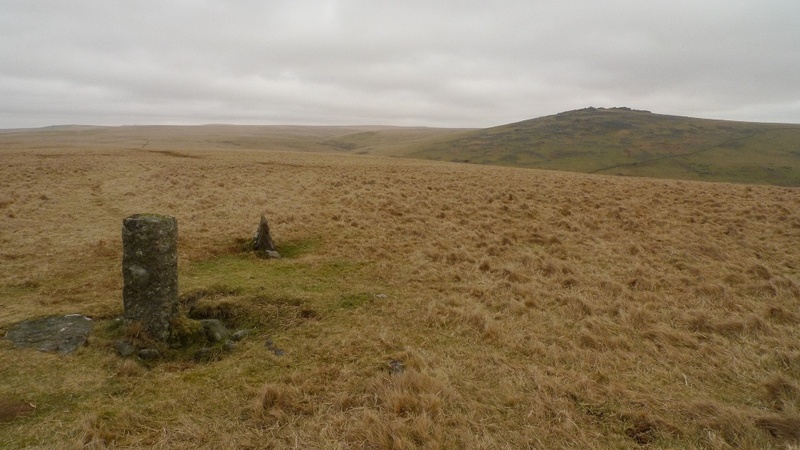 It was now time to turn our backs on civilisation and head deeper into the moor towards Roos Tor and the military pole that indicates when firing is taking place. 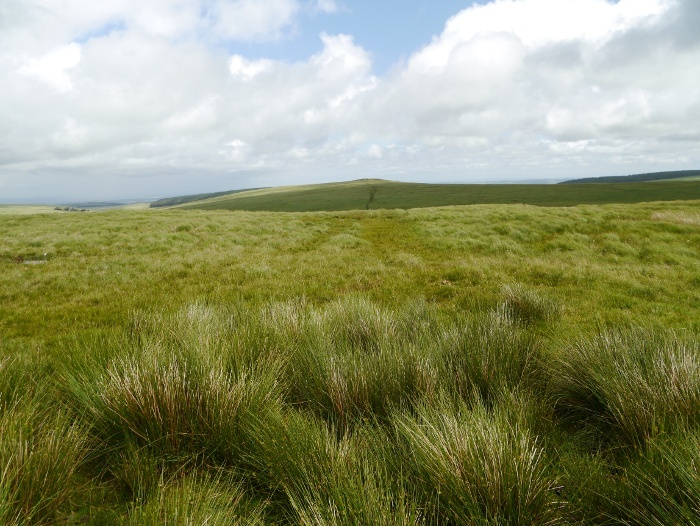 In front of me laid a vast empty landscape, the endless moor stretching on for miles. I think that it is pretty unique to have such a large area without boundary walls or fences. 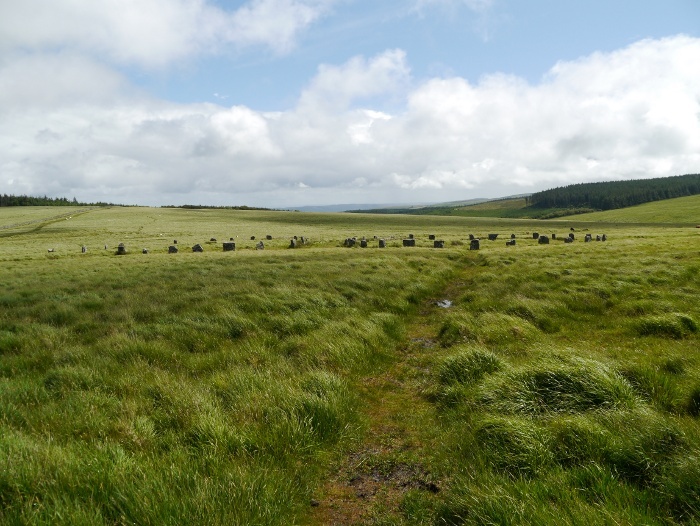 A feint path led of into the moor and it was a pleasure to stride out towards the distant stone circle. 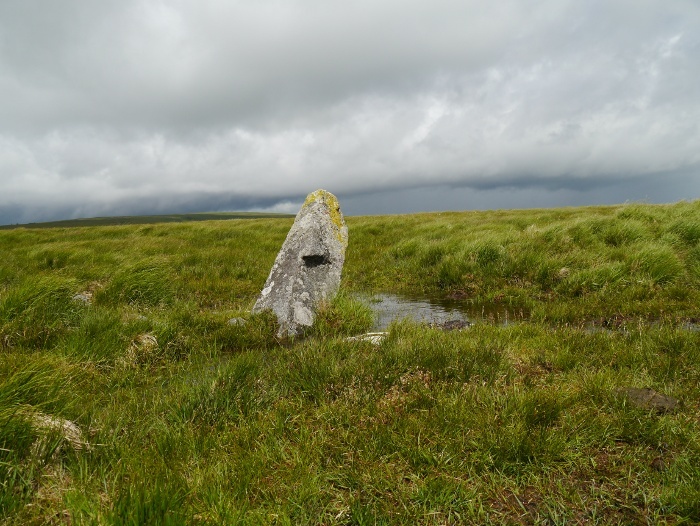 The map does not give it a name and the stones are low and or falling down but it is one of the few landmarks in the area. 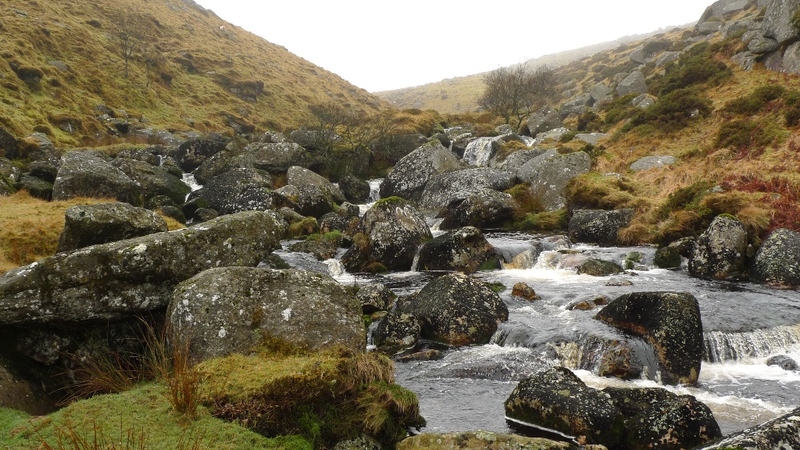 Set on a course directly for Great Mis Tor the river Walkham was reached , having descended for miles across the moors. 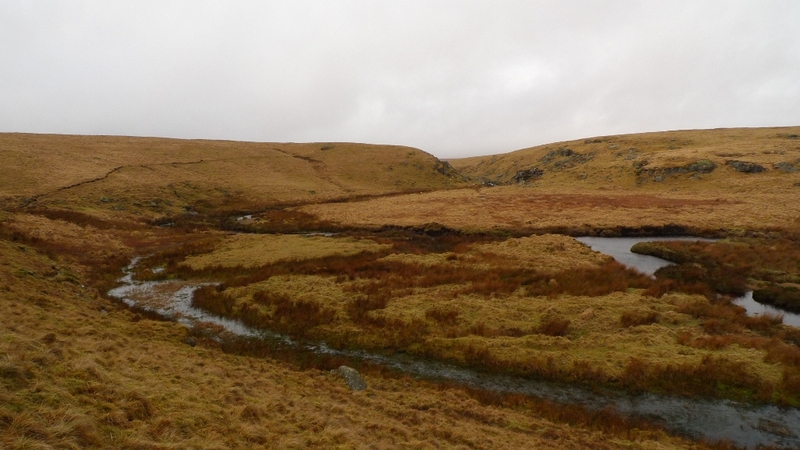 The map marks it as a narrow stream but on the ground it is most definitely an infant river. An obstacle to cross even on a dry day I walked up and down for a while looking for a safe spot. Some awkward balancing and boulder hoping got me across dry foot and then it was time to coax Reuben to make the crossing. He was unsure and spent a while running up and down the bank before crouching and attempting a mega leap, he got half way with a big splash! 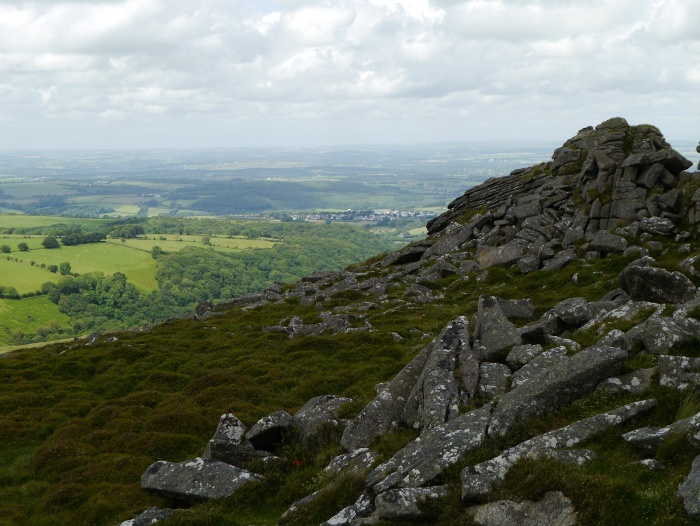 Great Mis Tor is the highest spot for some distance and once we had gained the summit Tor we sat for a while and took in the extensive views. 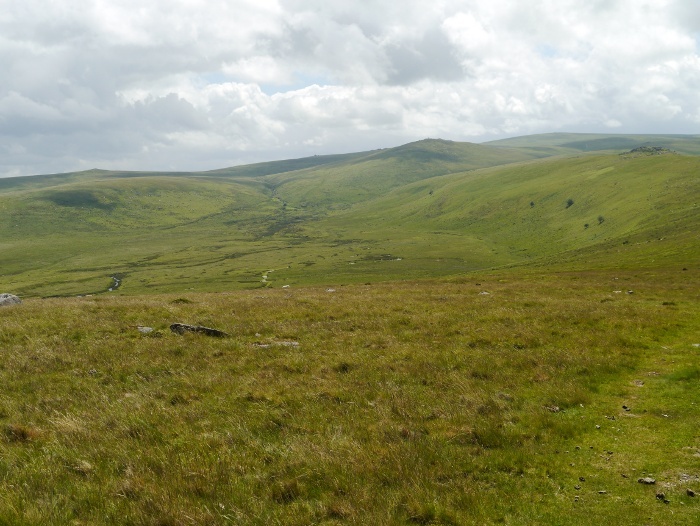 The valley of the River Walkham leads the eye towards the coast in one direction and the high moors in the other. 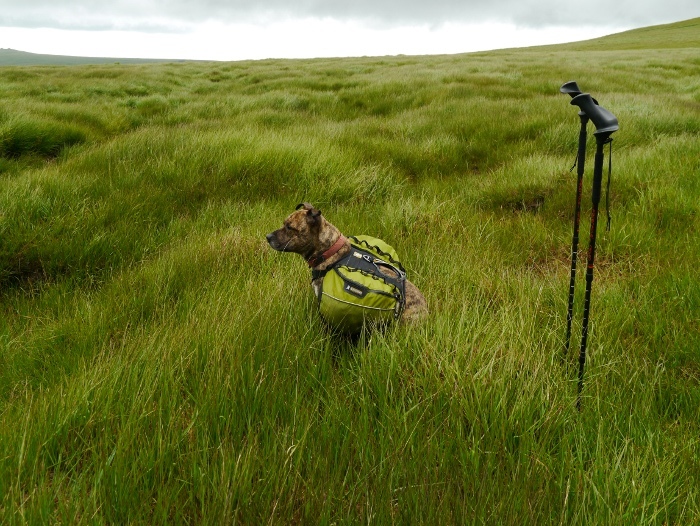 The van was just a short walk away but I wanted to be on the hills for a little bit longer and Reuben is keen to be out all day. Instead of following the track straight down to the road we branched off keeping to high ground in line with the track to Yellowmeade farm. 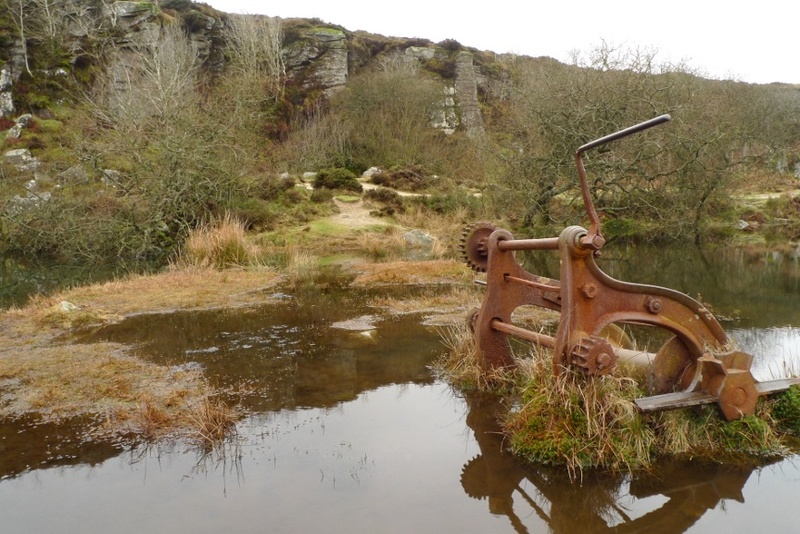 It was adding on the miles for the sake of it really but it was a pleasant enough stroll along the level track to Foggintor quarries and then up to Kings Tor. By now the sky was beginning to darken, the distant views disappearing in a grey haze. 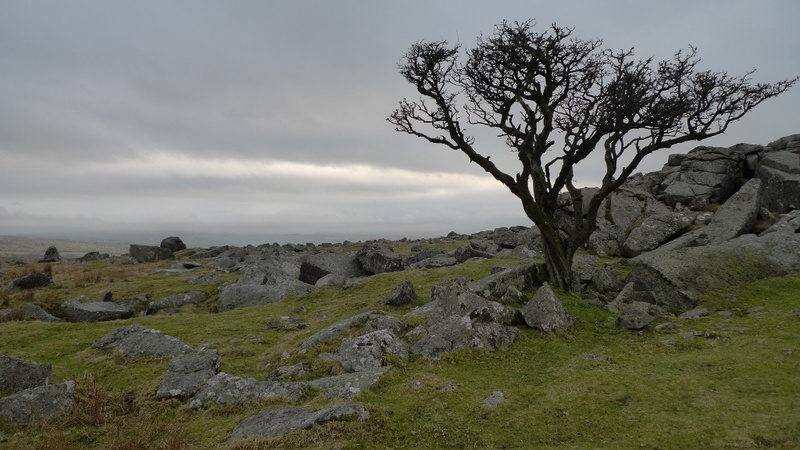 A solitary tree amongst the rocks made the scene in my eyes even bleaker. 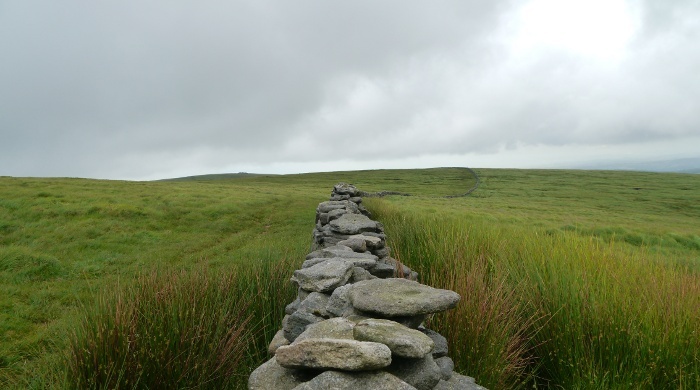 One of the highlights of this walk was going to be the stone rows just above where I had parked the van. 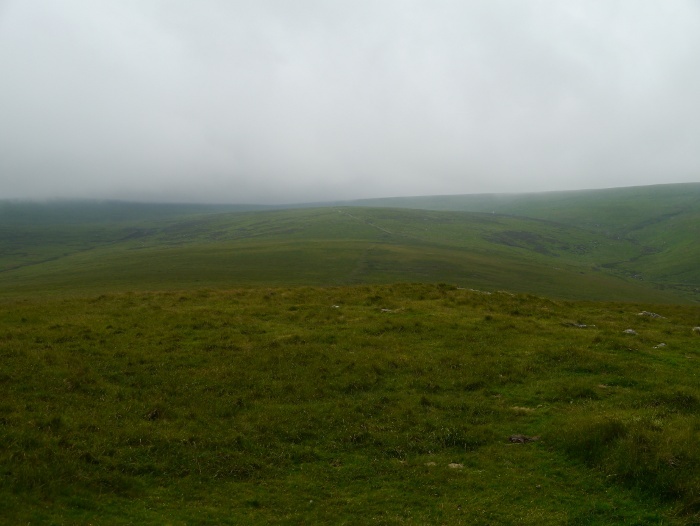 However just before reaching them the mist descended rapidly, drizzle dampening the air. 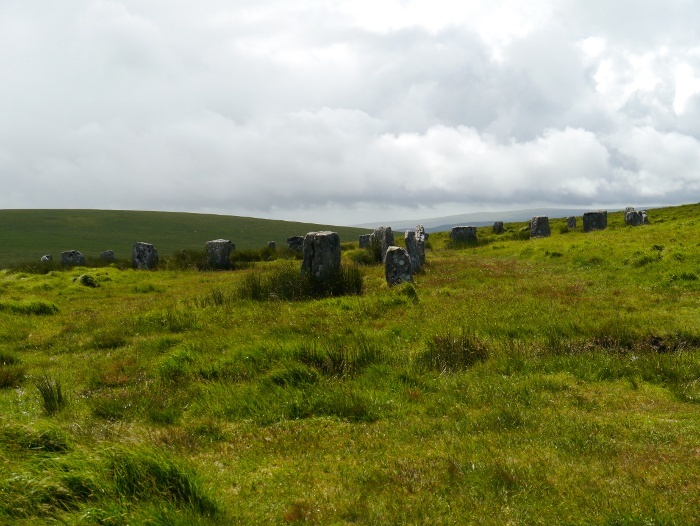 Walking past the large standing stone my enthusiasm for the hills and their antiquities vanished in an instant. I am sorry to say that I could not be bothered to walk the few hundred metres to them. 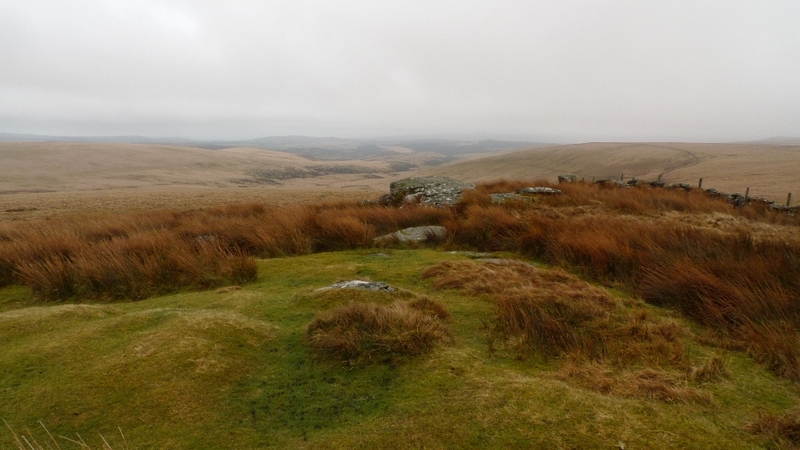 I got back to the van in a twilight world of murk, just how Dartmoor had been during most of the week. 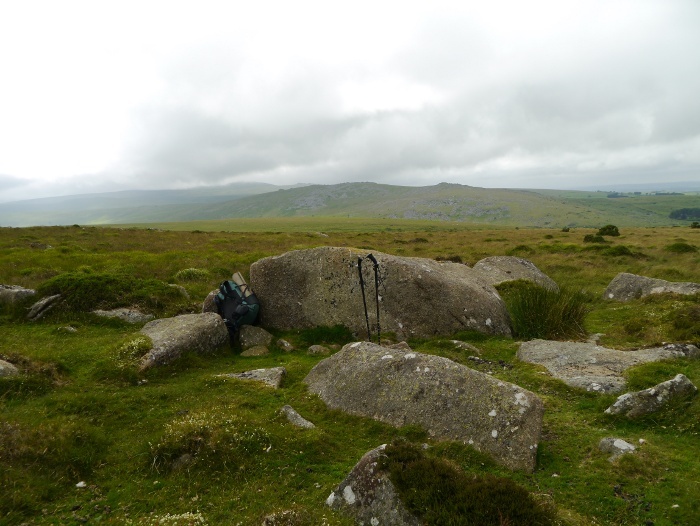 After the crowds on my walk around Hay Tor rocks I was looking forward to escaping into the wilds again. 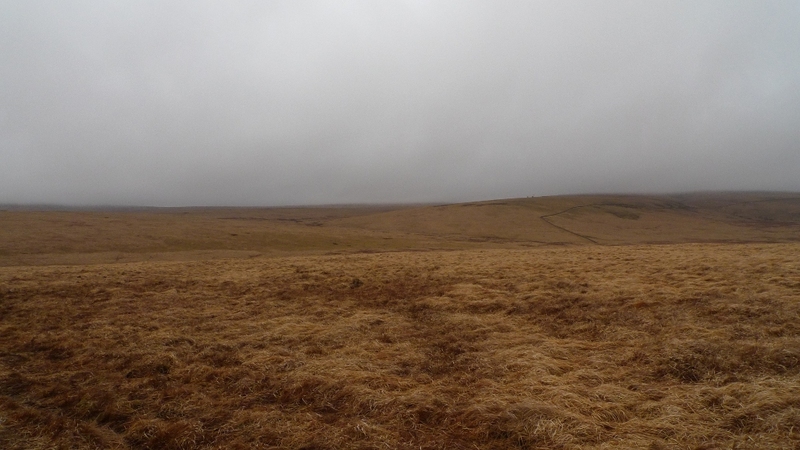 However in keeping with the whole week the weather forecast was on the dull and misty side, not the best for walking across featureless moorland. 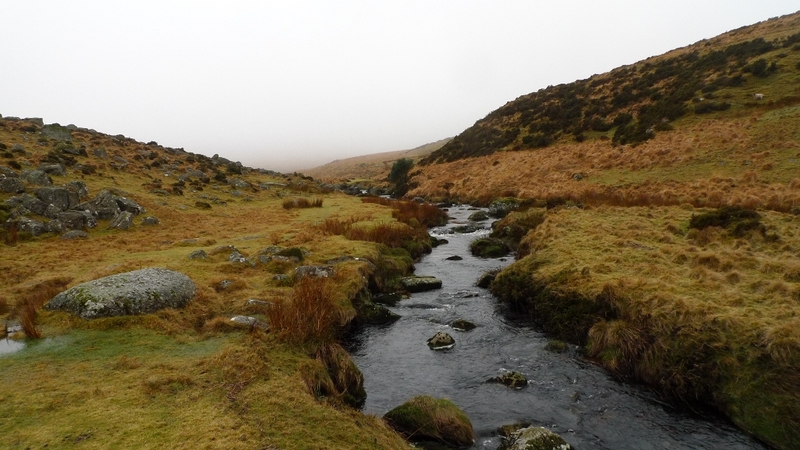 The East Dart river cuts deep into the vast northern moors, easy to follow when the mist is down. 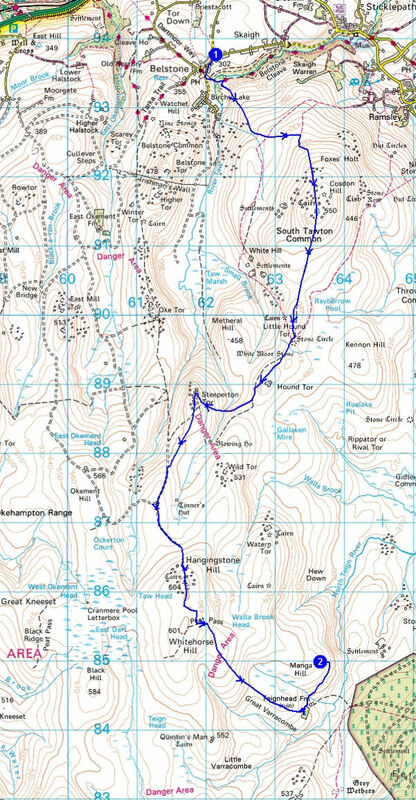 I therefore set off to simply walk to the waterfall up one side of the river and return down the other side. Thankfully a brief opportunity later in the day allowed me to explore further. I popped in to the village shop as I passed to pick up a paper for when I got back to the cottage. It is a curious place that is just a touch on the unfriendly side. Often small remote shops are a treasure trove of curios and local food and you are usually given a warm welcome. This was never the case on my visits to the one in Postbridge! Anyway lets move swiftly on before I ruin a small business. The large car park was once again nearly empty as I passed by, taking the bridleway on the west side of the river. The low cloud and mist was stubborn this morning with views even in the valley restricted. The clear path soon started to climb away from the river before dropping down to the curiously named Braddon lake which is actually a stream. 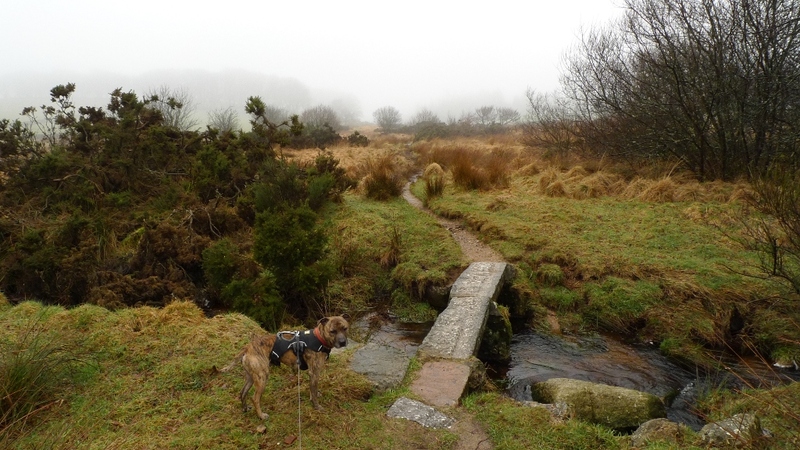 I thought about taking the path directly to the waterfall from here crossing Broad down, but was not too keen on a misty crossing. Instead I climbed a few metres up the hillside where there is a narrow but clear path alongside a disused leat. 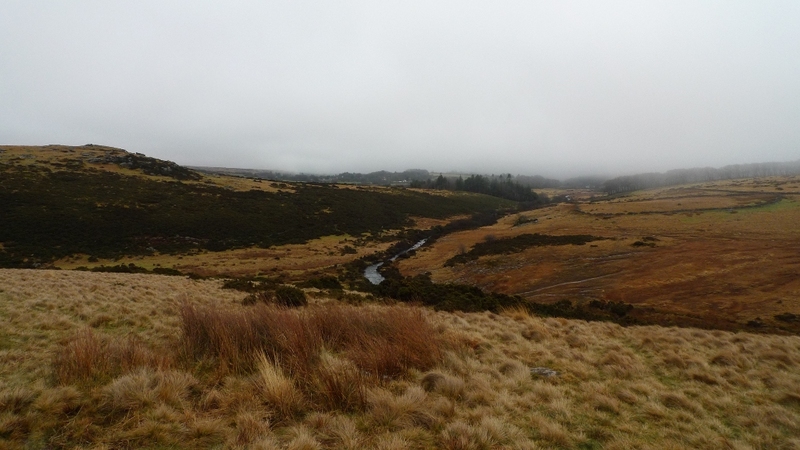 A brief clearing in the mist gave me a quick glimpse of the landscape towards Postbridge. 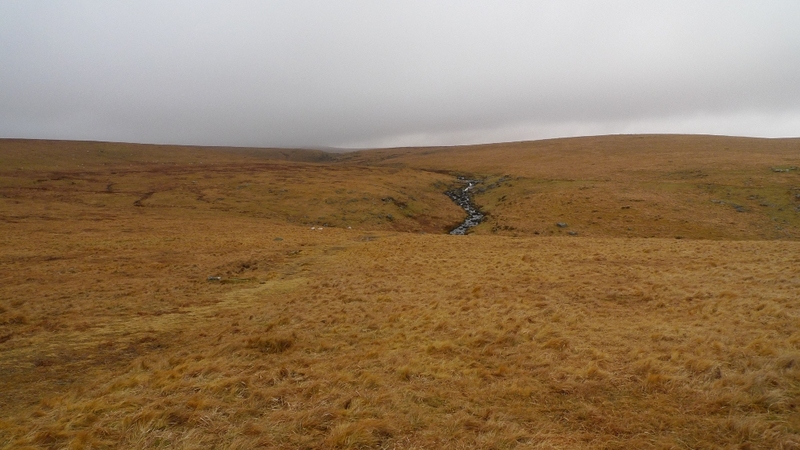 Walking along the leat was a delight as it contoured about 30 metres above the lively river below. The going was easy and I almost felt a little smug watching a couple of hikers on the other side of the river struggle along a boggy tussocky path. Yes I am fully aware that smugness is not something to be proud of! 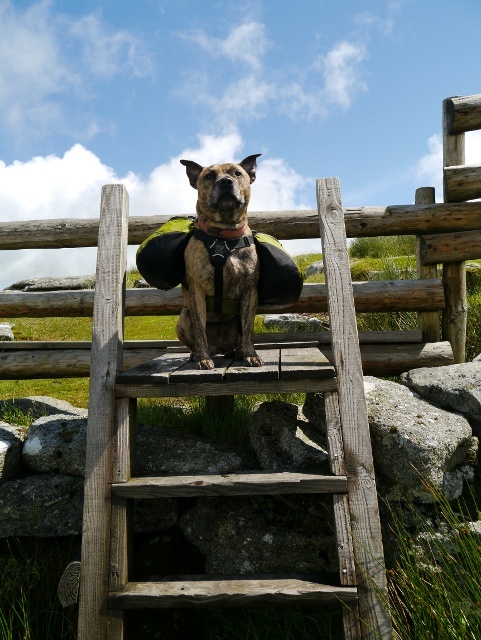 The leat soon came to an end at a stile which Reuben really could not get to grips with so was unceremoniously hoisted over instead. In the mist there was a slightly confusing section where the river almost doubles back on its self through a wide grassy bowl. 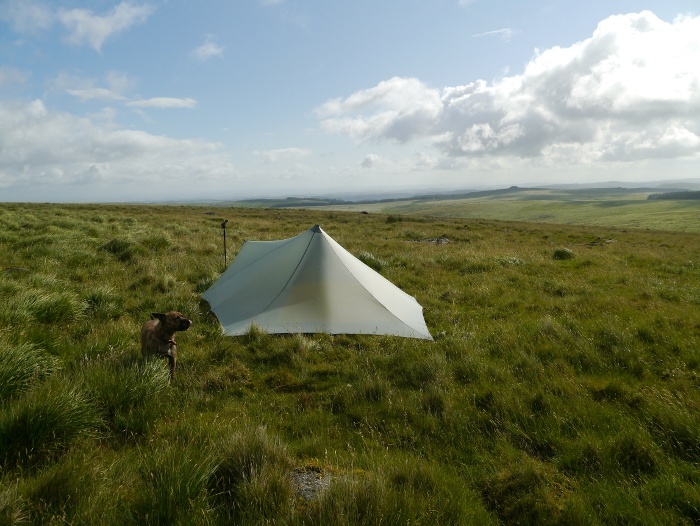 Now heading due west there are several areas that would make idyllic wild camping spots, a pleasant place to while away a warm sunny evening cooling the feet in the river. However not today as the mist dropped even lower and the contours around the river gathered closer together creating a small scenic rocky gorge. 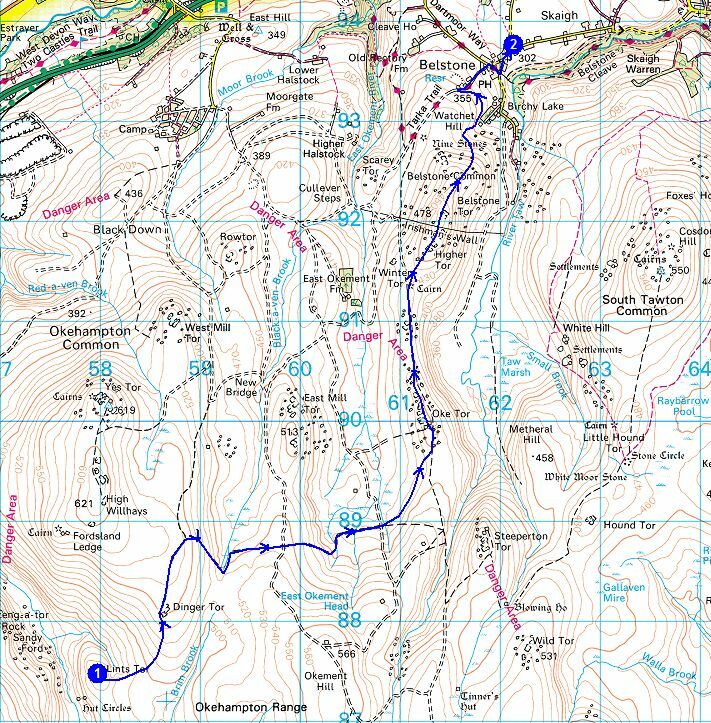 We were suddenly at the waterfall marked on the map and I have to say that it was a bit of an anticlimax, it must have been all of six feet high. 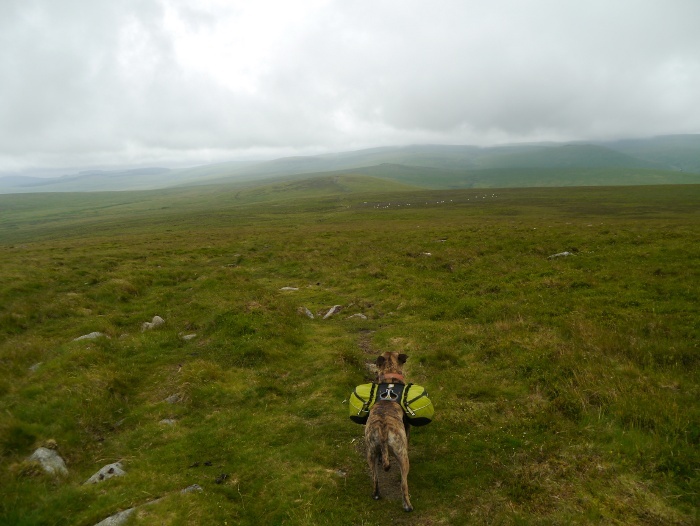 I actually started to doubt my map reading not believing that I had actually reached it. 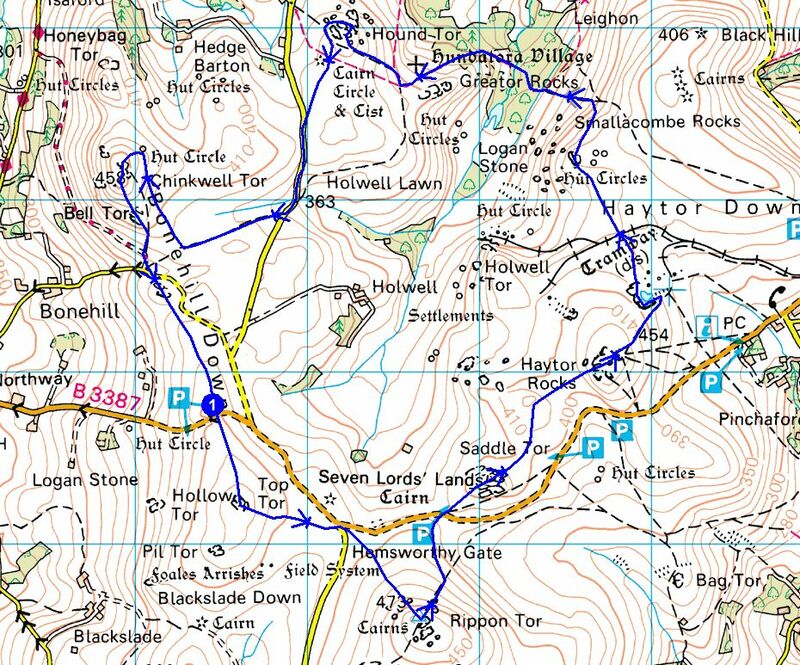 I resorted to checking the OS map on my Iphone which confirmed that I was indeed where I though I was. 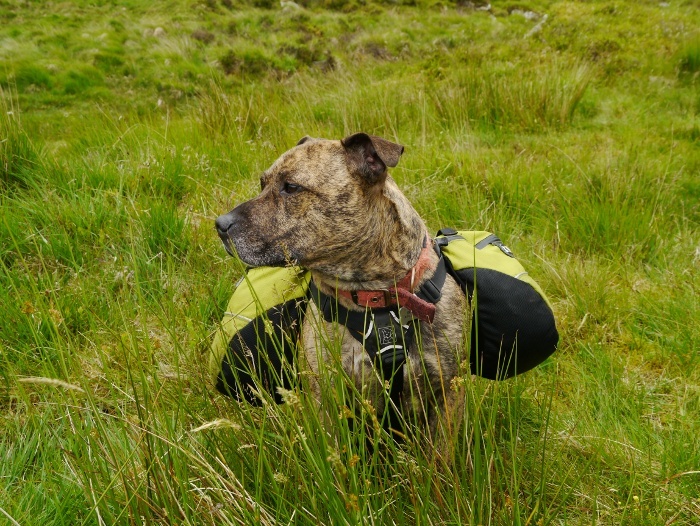 I skulked behind a rock for a bite to eat and a flask of coffee whilst Rueben sat looking at me with hungry eyes and a slight damp shiver. 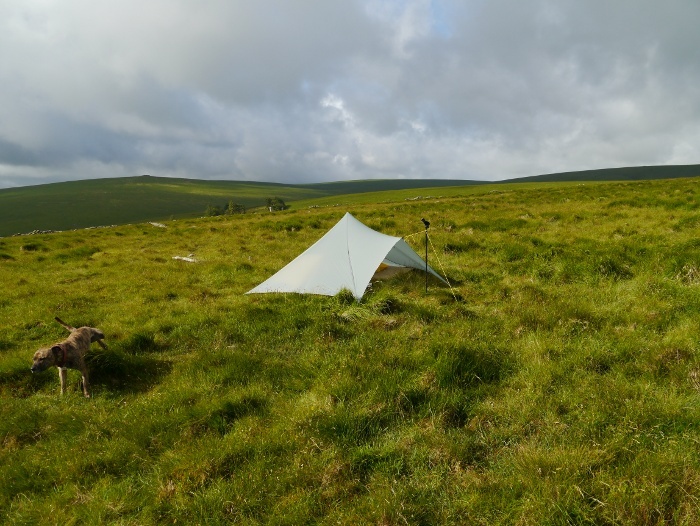 I decided to call it a day, head over Broad down and back to Postbridge. 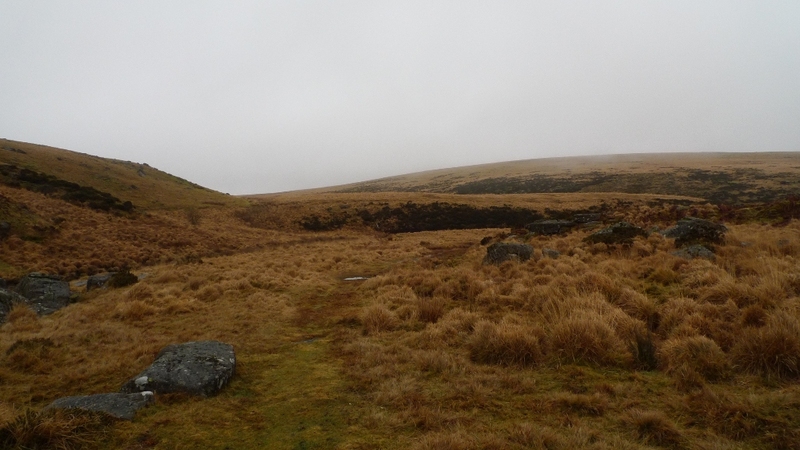 Although not marked on the map there is a clear path that runs across the moor and I was soon heading towards Braddon lake, surrounded by a world of mist and murk. My phone suddenly rang and it was my partner who informed me that Postbridge was dry and sunny today! Then whilst I was letting her know that I was heading back to the cottage the mist suddenly vanished. 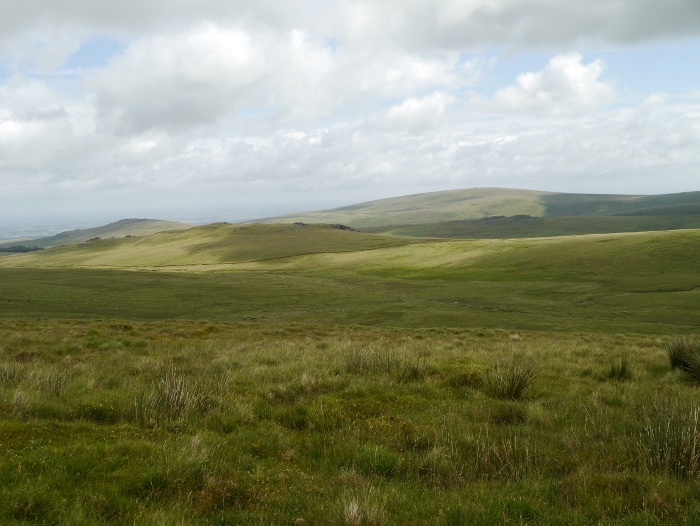 The weather transformation was immediate and the hills all around were now visible. As with the weather I had a sudden change of heart, let my partner know my plans and headed back the way I had come. 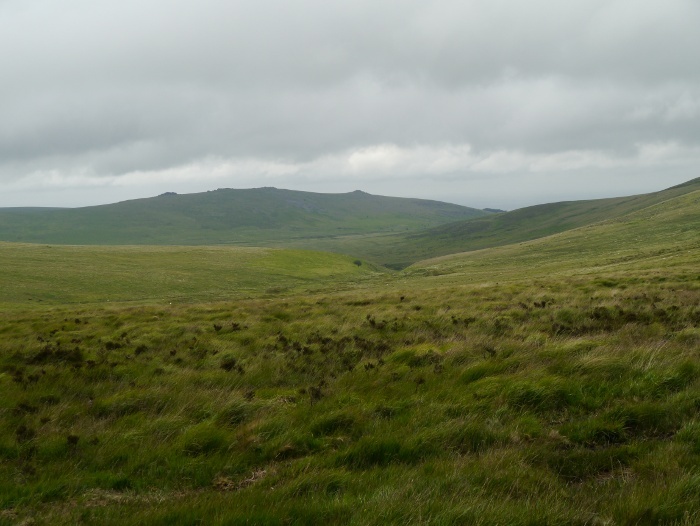 For the first time that day I got a view into the heart of the moor. Passing the waterfall I continued alongside the river, eventually coming to the shallow gorge of Sandy Hole Pass, a nice wild spot. 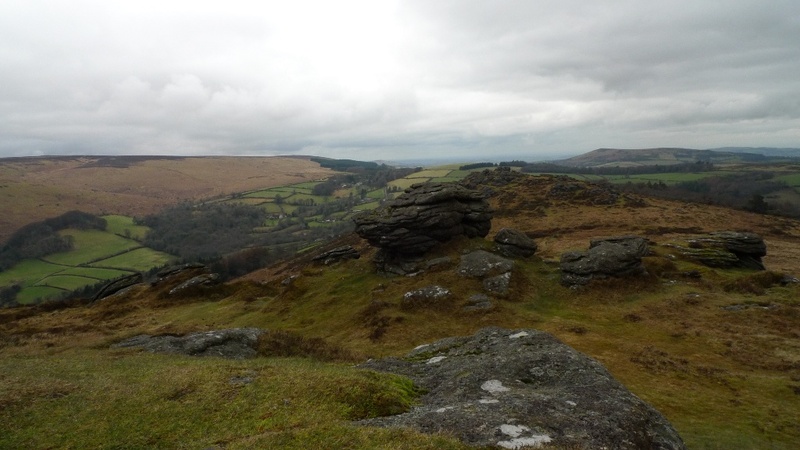 Cut hill was now visible on the horizon and I really fancied climbing to the top and then continuing to Fur Tor. 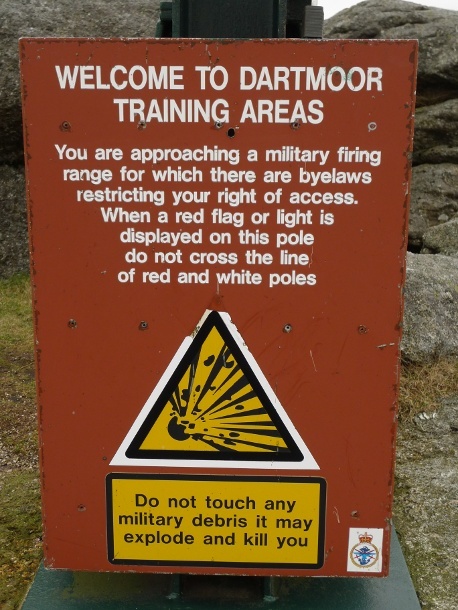 However the red flags were flying meaning that the military were using live ammunition. 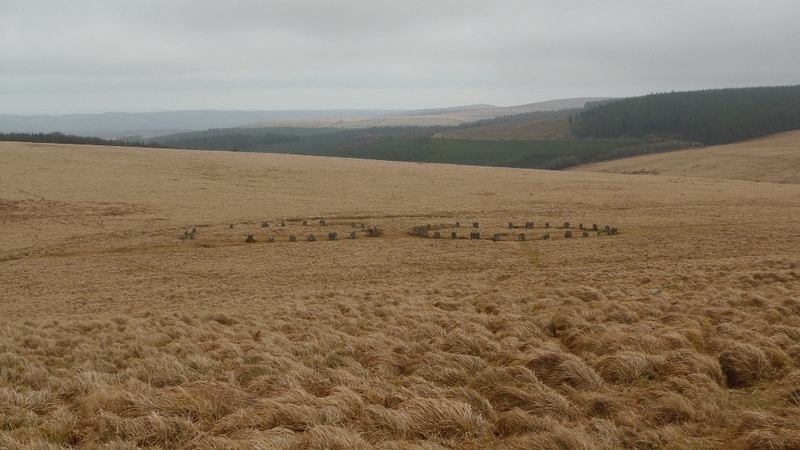 Instead the Grey Wethers stone circle looked to be a good destination for the day. I got to the southern edge of Broad Marsh and looked for a place to cross the river but it was a few feet deep. Broad Marsh itself looked like a spot not to be messed with, anything with the word marsh is probably best avoided on Dartmoor! Also Broad Marsh is the name of the worst shopping centre in Nottingham, a place full of rundown pound shops. Also best avoided. Further upstream the river becomes rockier and shallower. 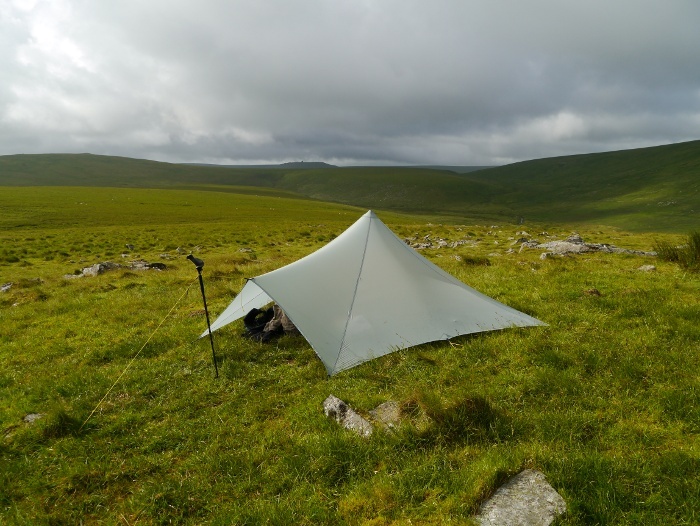 I tried the tested method of moving quickly before my gaiters could fill with water, but half way across it was up to my knees. Boots and socks were taken off on the other side and wrung out / emptied. It took some coaxing to get Reuben to take the plunge. 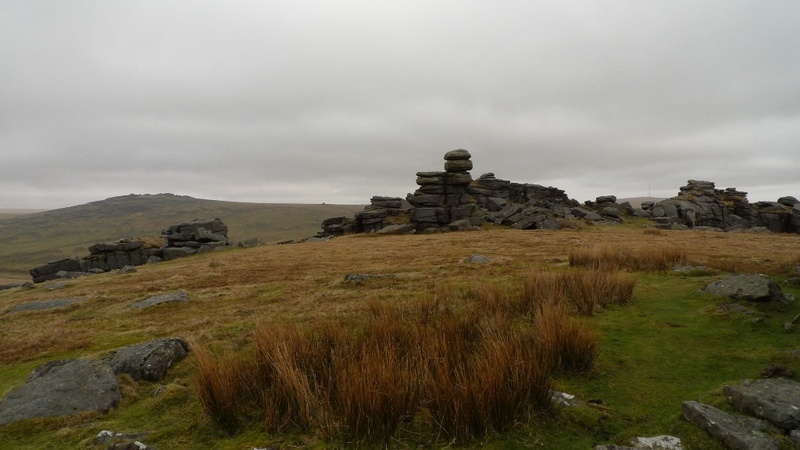 It was now time to cross the trackless moor. 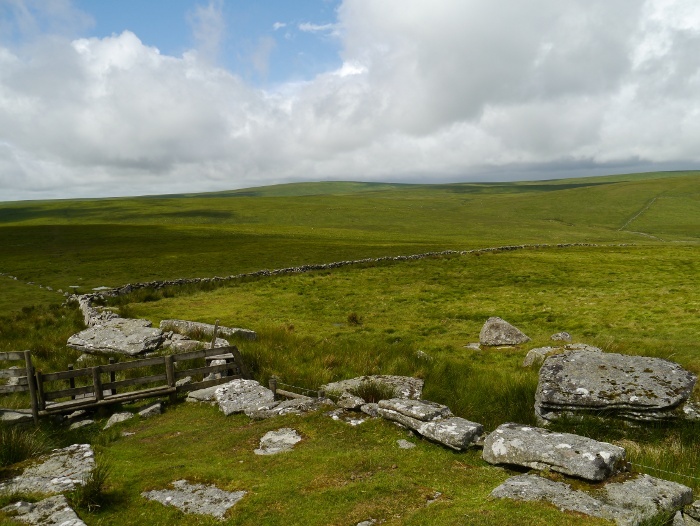 The ruin of Statts house was an obvious landmark to head for and it turned out that there was a clear path from there to Sittaford Tor. The sting in the tail however was the crossing of a boggy stream half way across. 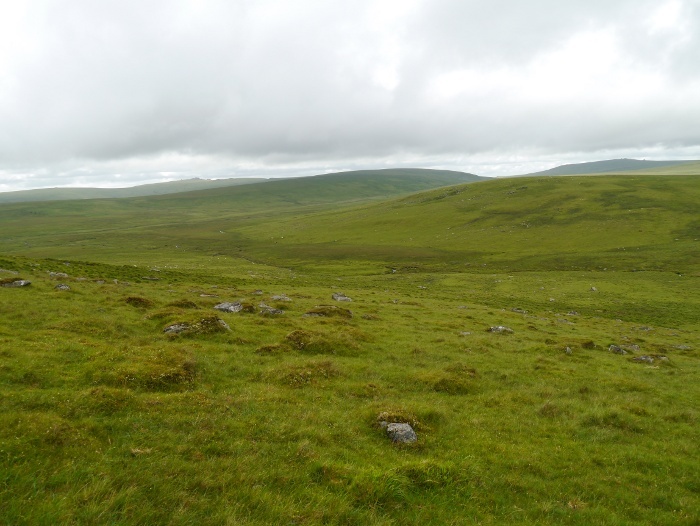 The surroundings were a mess of green quaking bog, the ground wobbling as I walked gingerly across. I had a feeling that if I went in I would never be seen again! 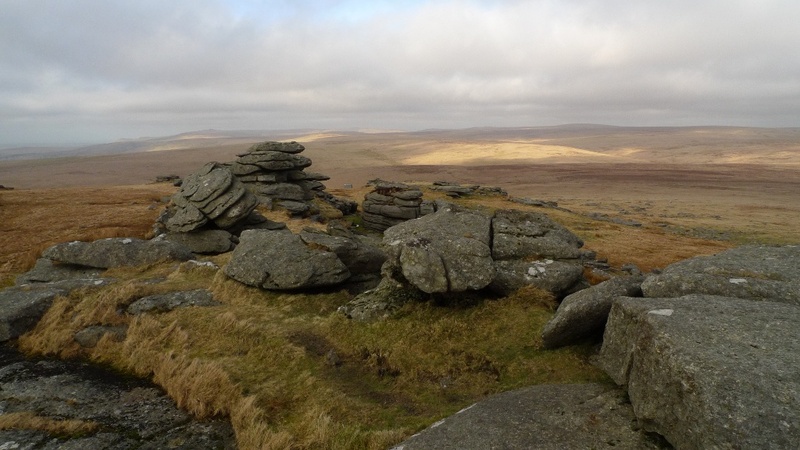 Although Sittaford Tor only rises a few metres above the surrounding moor and fails to have a half decent tor, it is a good bleak vantage point. 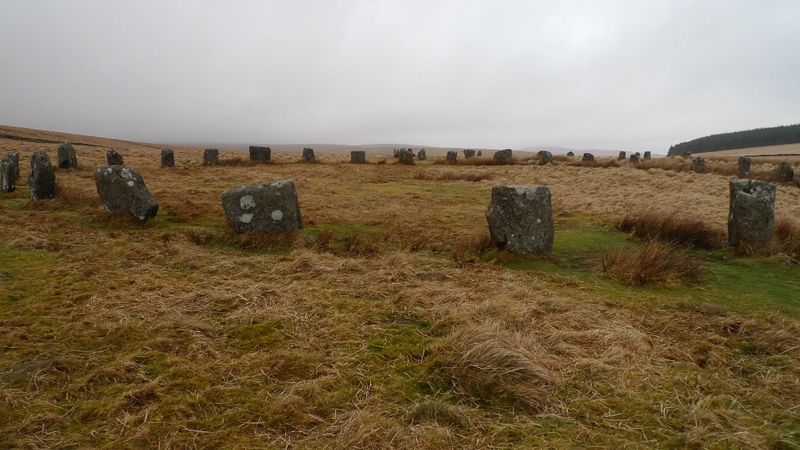 Descending the other side I caught my first sight of the rather impressive Grey Wethers stone circle, definitely a case of two for the price of one. 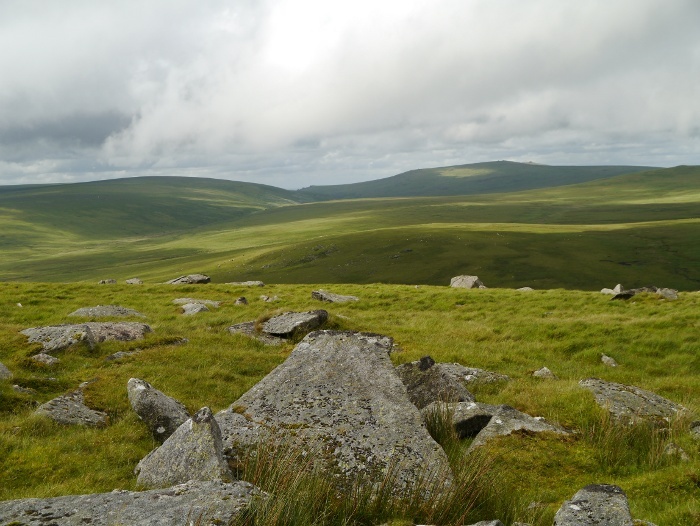 One story tells of a farmer who had recently moved to Dartmoor and was foolish enough to criticise the sheep on sale at Tavistock Market. He stopped for a drink at the Warren house inn, and helped by several pints of cider, the locals persuaded him that there was an excellent flock of high quality sheep nearby which he would be welcome to buy. They walked off in search of them, and through the mist the farmer saw what he took to be a fine flock. 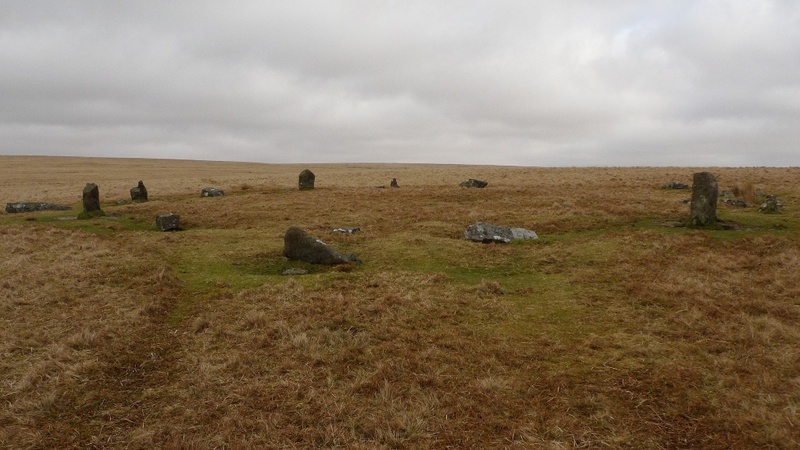 He agreed to the sale, and returned to the site the following morning to find that what he had taken to be sheep were actually the stones of Grey Wethers. 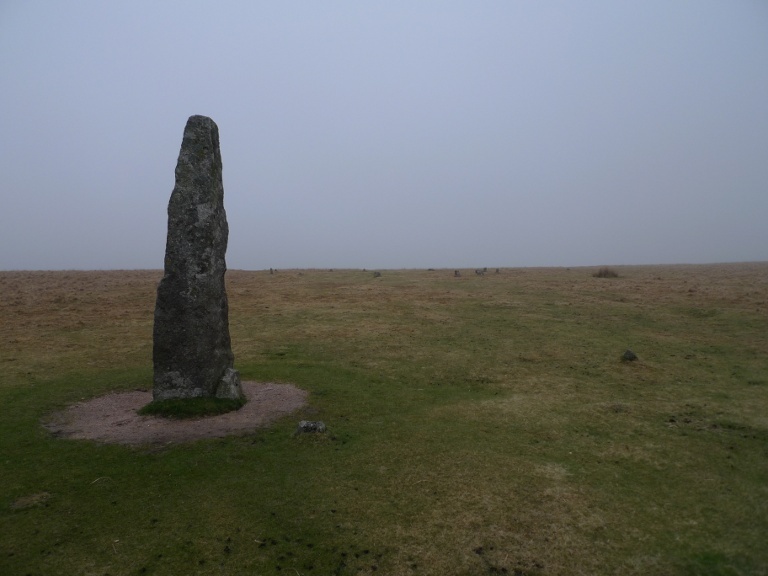 Whilst I was sitting relaxing next to one of the stones the mist suddenly rolled down out of nowhere, accompanied by heavy rain. 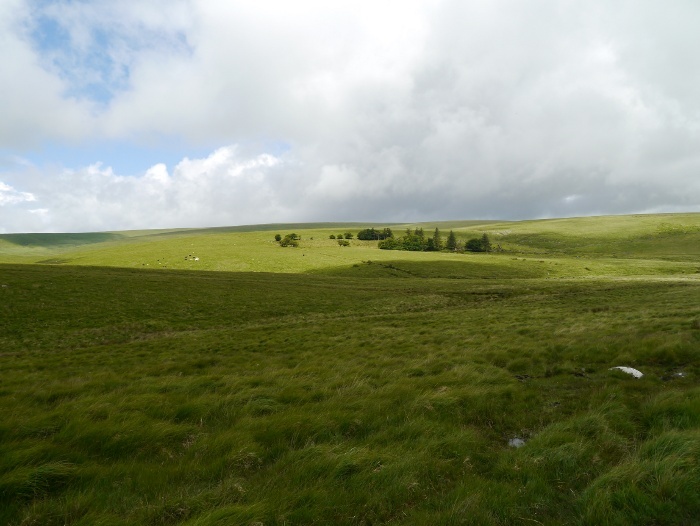 It was a wet and boggy trudge south down a unamed valley back to the East Dart river on a path not marked on the map. 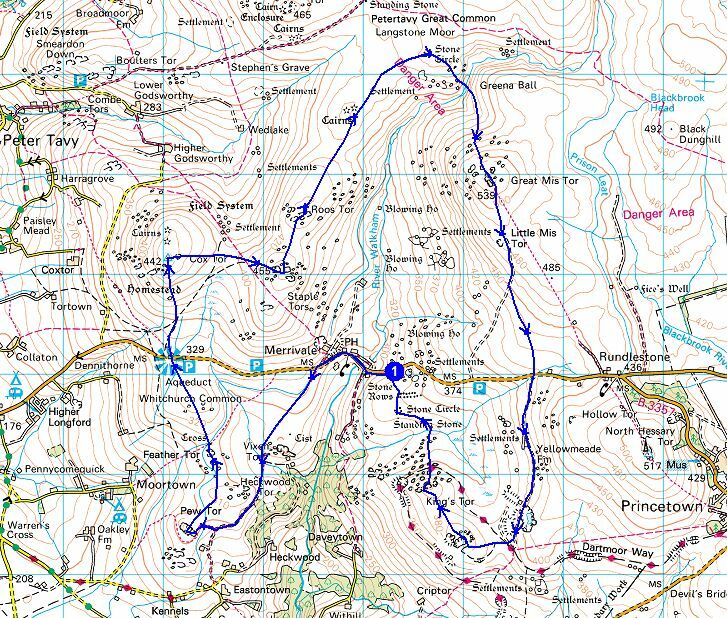 The bridleway that is marked would involve swimming through some pretty nasty looking bogs. The unrelenting rain and mist accompanied me all the way back to the cottage. 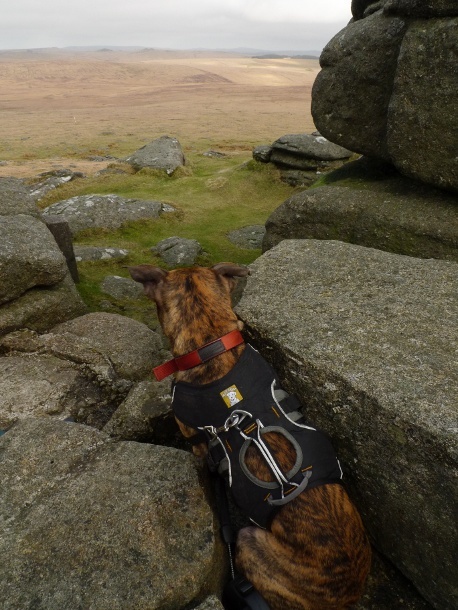 I sat here for ages trying to come up with a witty title that described a dog on Hound Tor. I’m afraid to say that this is the best that my brain could come up with. 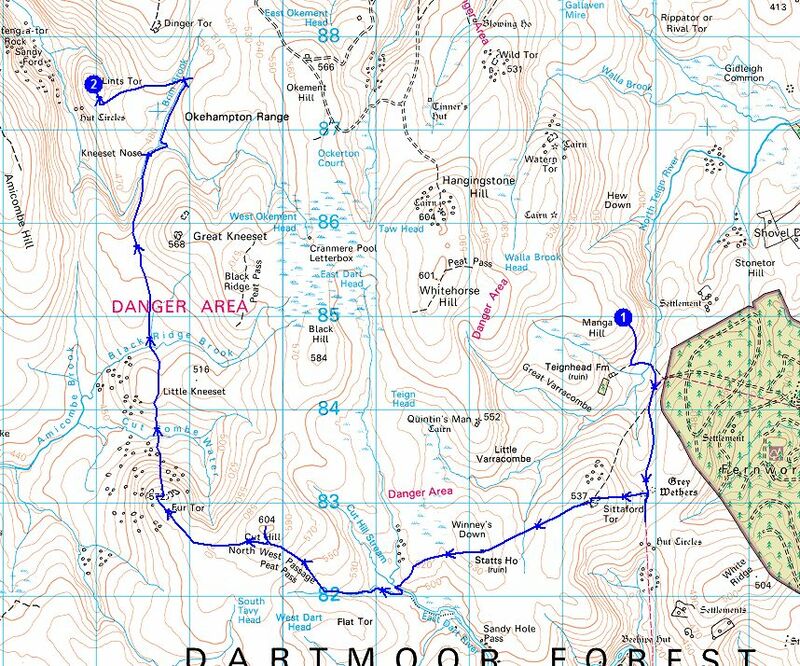 Looking at a map of Dartmoor I noticed that to the South East the unbroken wilds of the moors end and pastoral valleys make an appearance. 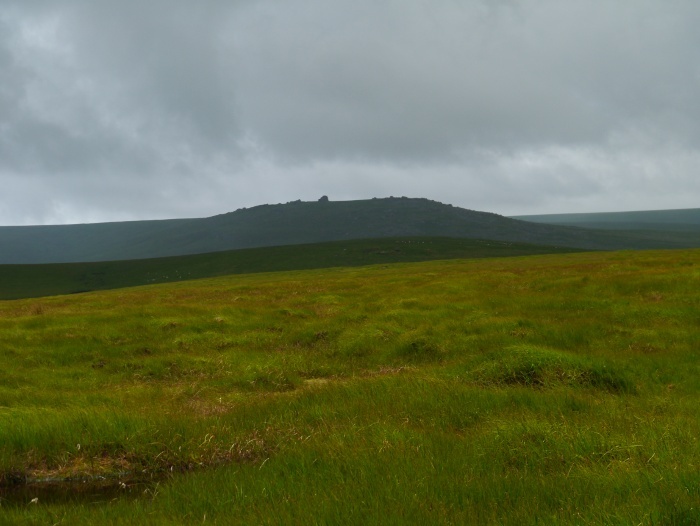 The moors still rise up but slightly lower and not as extensive. However I noticed the word ‘Tor’ liberally scattered over the map. 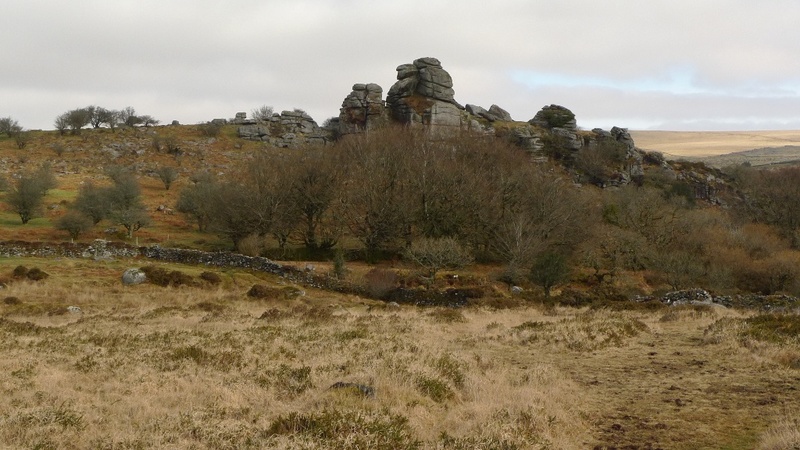 With the continuing dull weather during my week on Dartmoor I decided to escape the endless bogs and tussock grass and explore the environs of Widecombe in the Moor. 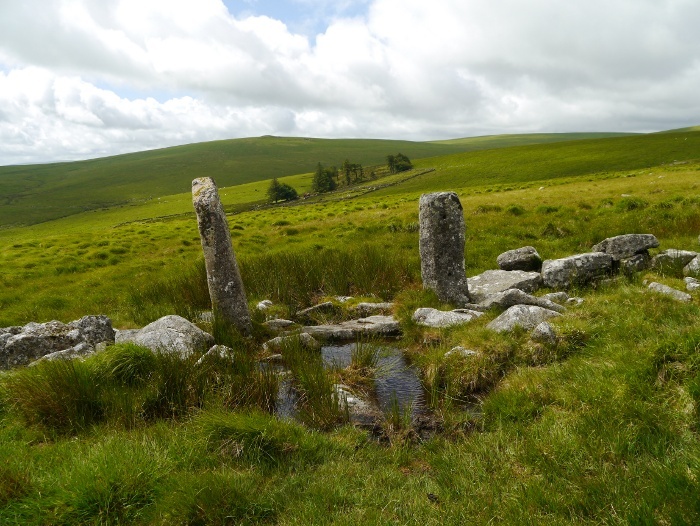 Parking the Bongo on the highest part of the B3387 just outside Widecombe, I soon realised that this part of Dartmoor is much more popular than the wild interior I had been exploring. 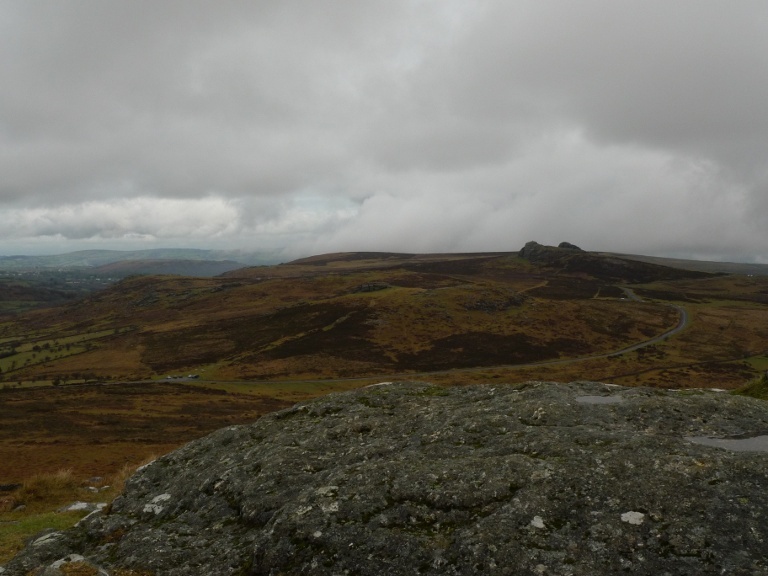 The roads were busy with a constant stream of traffic as we headed to the summit of Top Tor, a mere 30 metres higher than the car park. 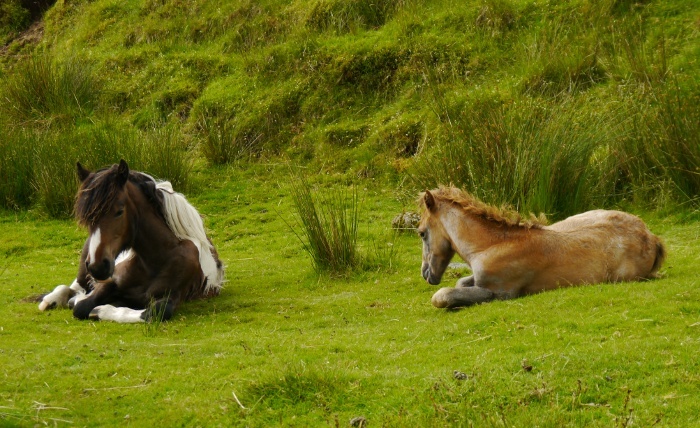 A herd of ponies had already occupied the summit. Approaching them via Saddle Tor I let my imagination take over and from this angle thought they looked a little like An Sgurr on the Isle of Eigg . I stood and watched a strange-looking figure walk slowly to the foot of the cliffs. There was something odd about them that I could not figure out. Getting closer I noticed that they were dressed as a medieval knight brandishing what looked like a sword. I thought that this may have been some lucid hallucination brought on by only having the dog to talk to for a few days. He then started conversing with people on the cliffs above which put my mind at ease as I climbed towards the top. 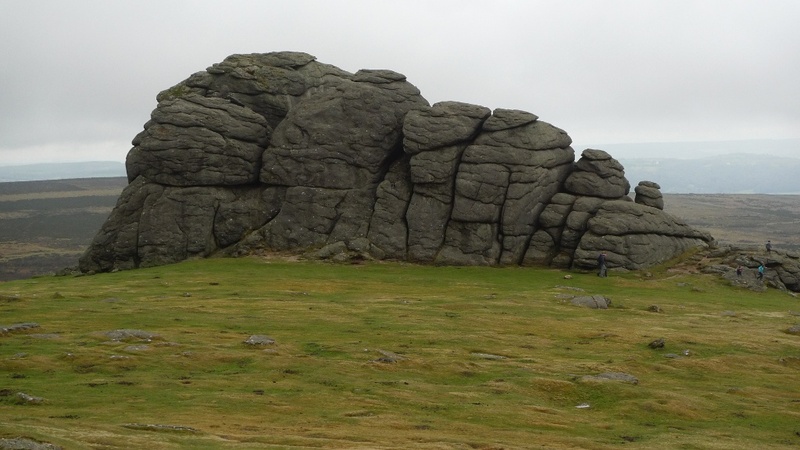 Haytor is pretty impressive and split into two separate tors, the first being the buttress of rock in the photo above. 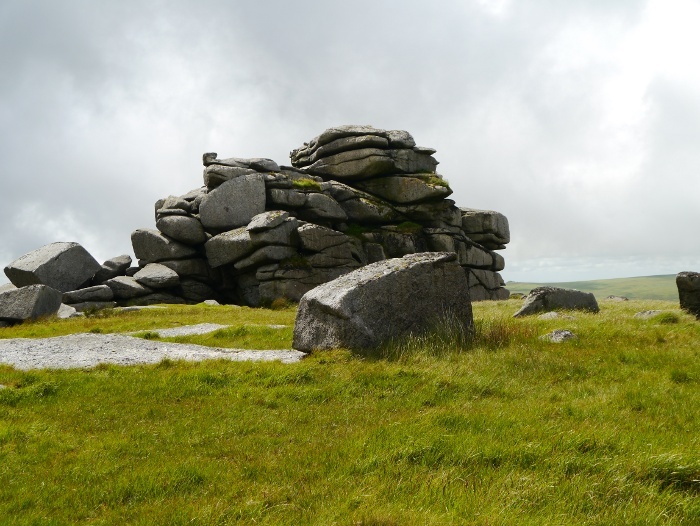 A wide green swathe of grass separates it from a great lump of granite. 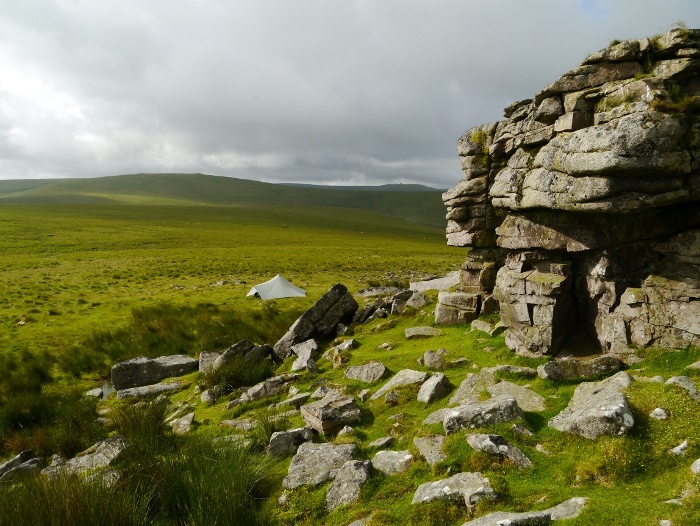 I was now in the midst of honey pot Dartmoor as the place was absolutely heaving with people. 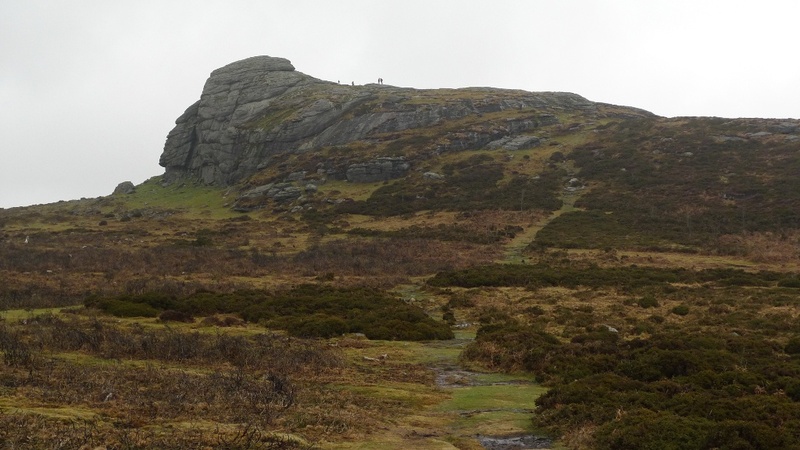 I fancied a scramble to its summit and walked round the other side where the climbing is easy. However it was absolutely crawling people, looking like the whole of the south-west was gingerly climbing up or shuffling down on their bottoms. 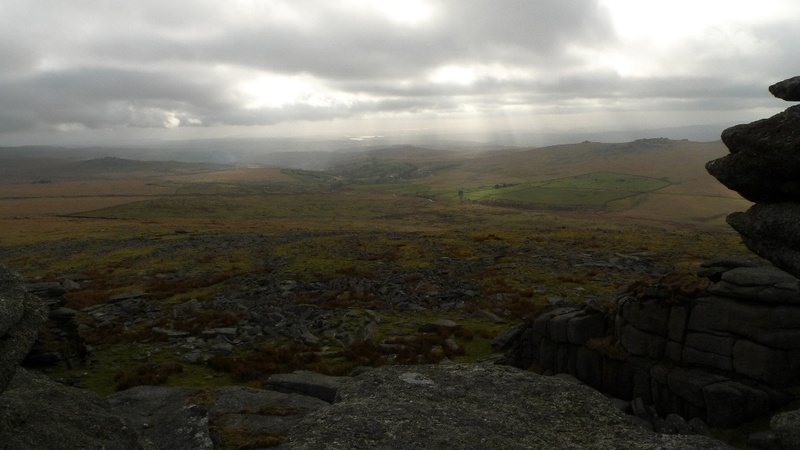 I decided against it, turned my back to the masses (I am a committed misanthrope) and headed down the empty slopes towards Haytor Quarries where I found silent sanctity for a few moments. 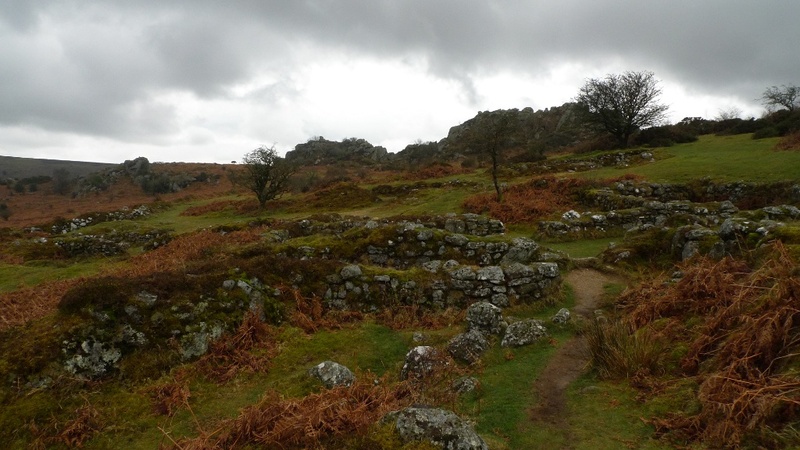 A path led out of the quarry and across the open moor to Smallacombe rocks. 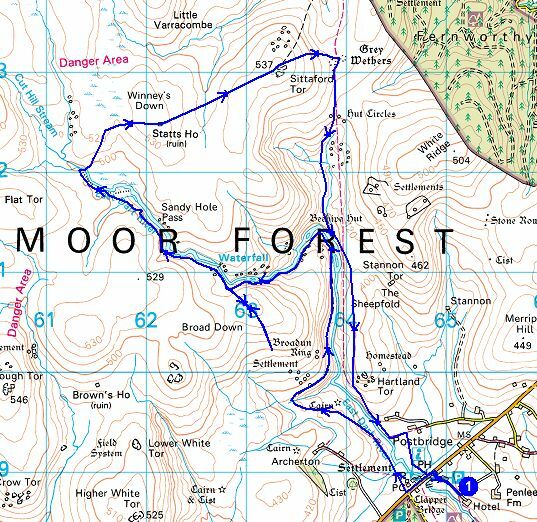 They do not look like much on the map but it is a great viewpoint down into the secluded valley of Becka Brook. Descending into the valley it looks like a good place to explore, although unfortunately half of it is not access land. 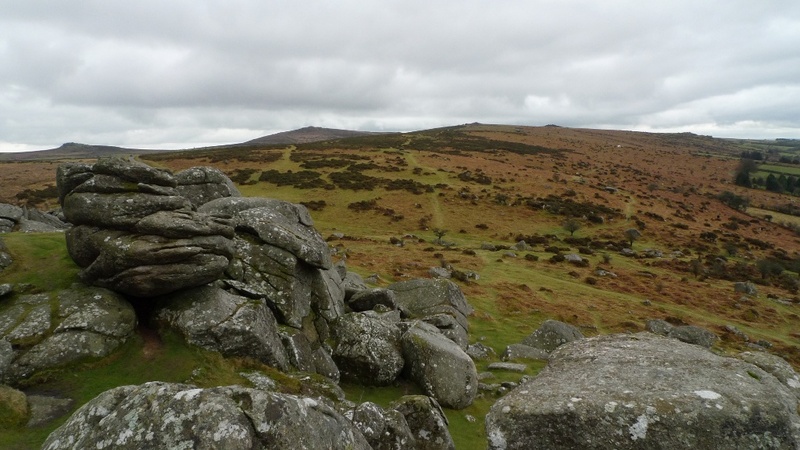 Descending to the bottom and climbing the other side, the rocky ridge of Ger Tor is passed (a potential scramble along its spine?) and we came to the remains of a medieval village. The walls are clearly visible and it is an atmospheric spot. 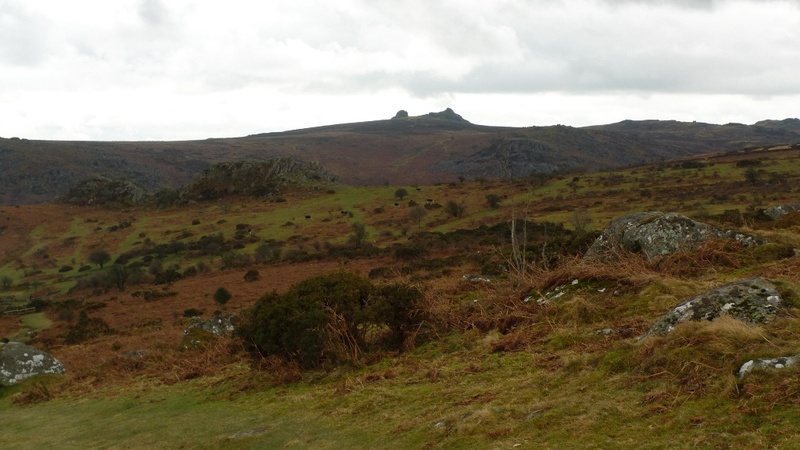 Behind and now on the far skyline, Haytor rocks are instantly recognisable as they thrust up from the moors. 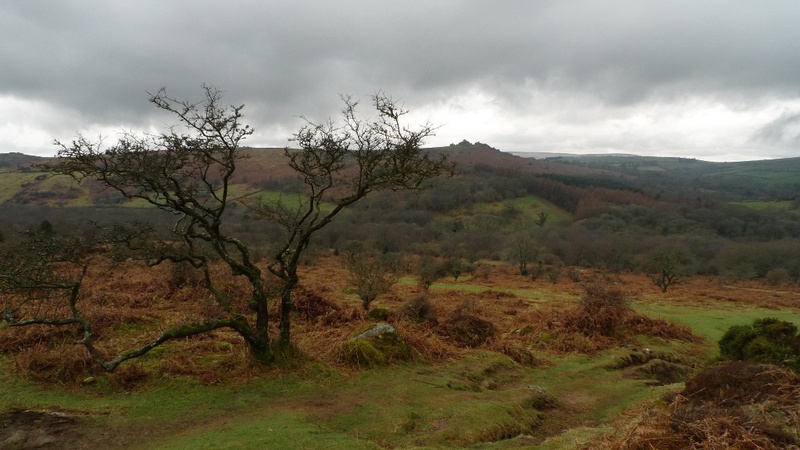 Hound Tor our next destination is a large spread out tor, looking like a fortified castle from a distance. There are several stacks of rocks just crying out to be climbed and there were a few families doing just this. 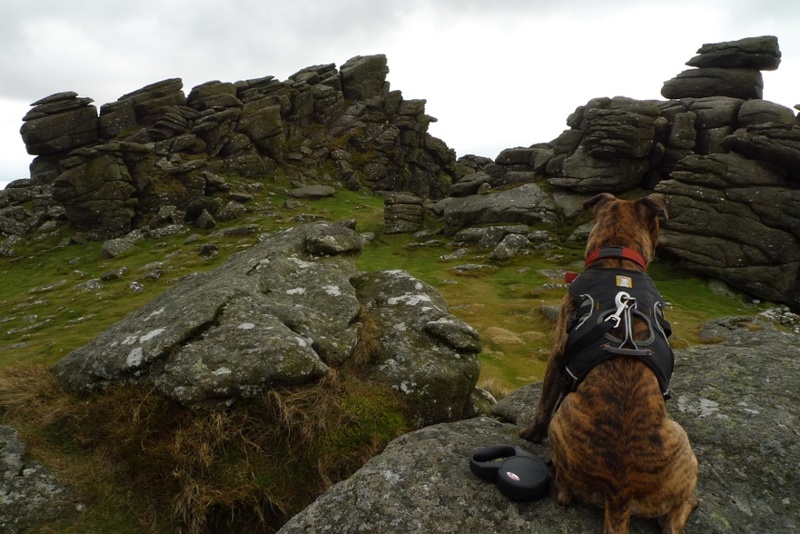 I could not pass up the opportunity to snap a photo of Reuben sitting on the rocks of Hound Tor! 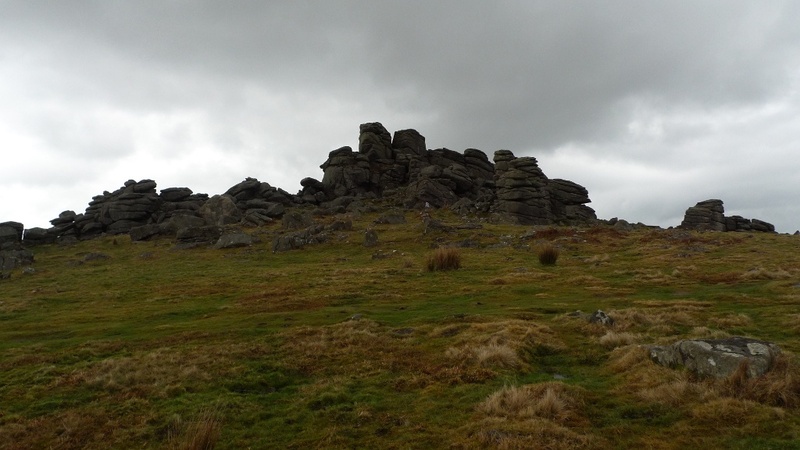 The climb up to the summit of Chinkwell Tor included a bit of a dog-leg as the land in between is not access land, but it was worth walking out on a limb for. Hamel Down dominates the western skyline, rising up from the green fields below. Descending I was asked by a guy coming up what the wind was like up there and from what direction it was coming. This was something that I had not even registered and he gave me a funny look when I said that I did not know. Looking at what he was carrying on his back I think he was planning on becoming airborne, so I suppose that the wind was pretty important! Bonehill Rocks on the other side of the road is a nice little tor, lots of nooks and crannies to explore, children having fun on its rough boulders. 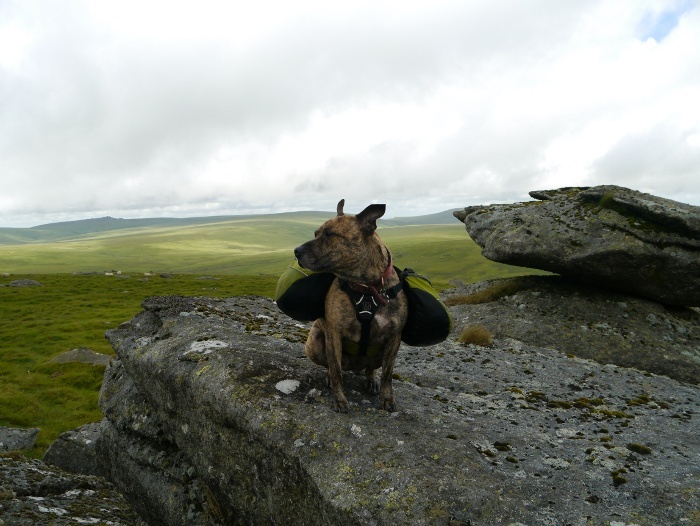 Reuben also showed off his scrambling prowess managing to climb an improbable looking rock. 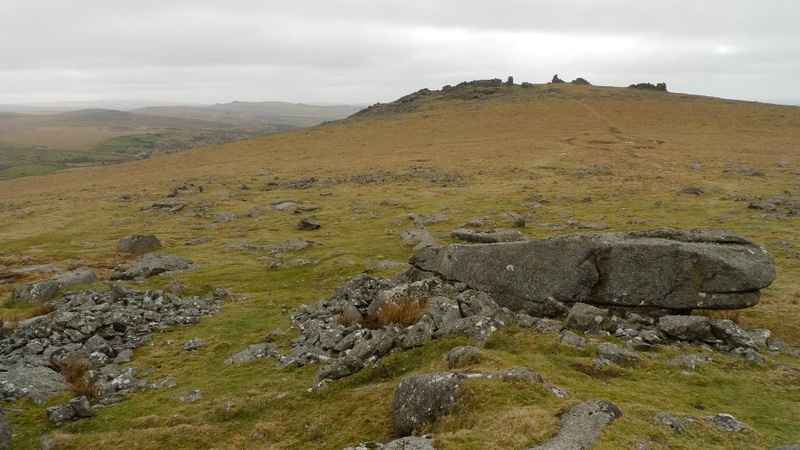 On the easy stroll back to the car I decided that although very scenic this area was my least favourite part of Dartmoor visited so far. 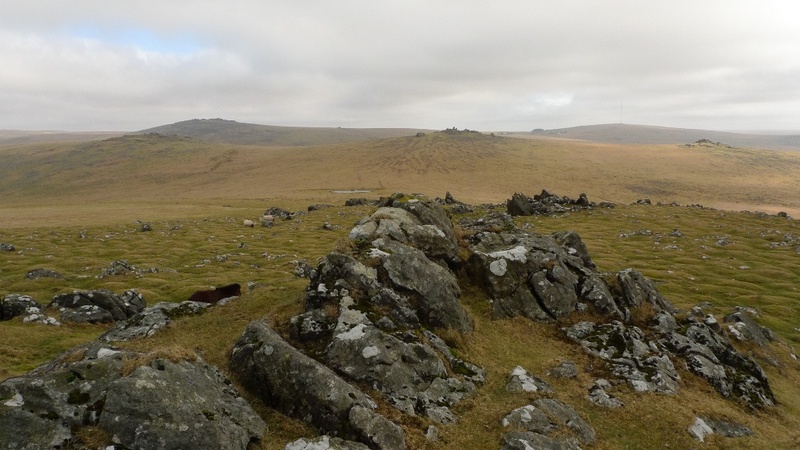 Due to its accessibility it is very crowded even midweek in February (although it was the school holidays). 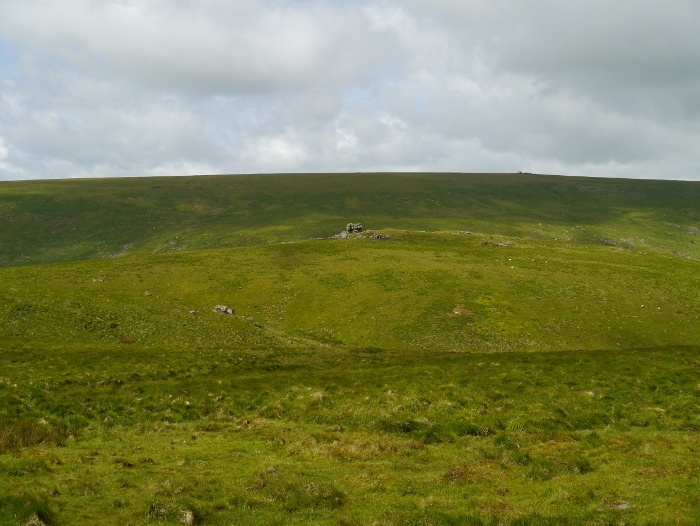 It is also difficult to devise a long walk due to the fractured nature of the moors and access land. 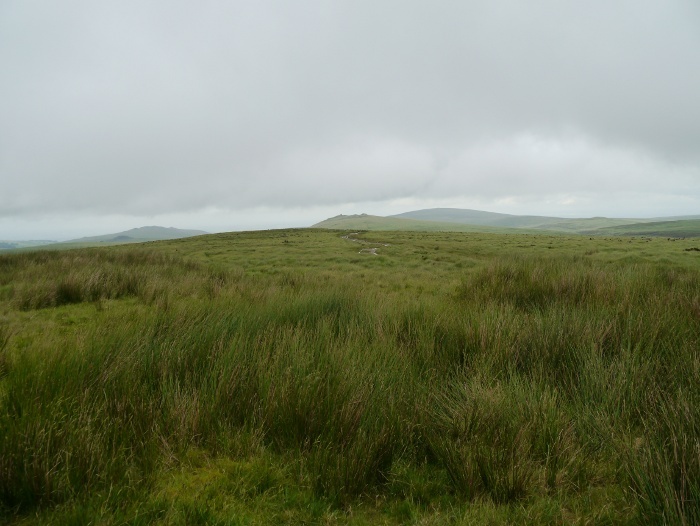 The wild unbroken north moor appealed to me most and I decided that I would explore its hinterland the following day, mist or no mist!